Opened in 1913 and built from granite mined from Sunset Mountain, the resort offers 510 guest rooms (including 12 suites) located in both the “Historic Main Inn” and the more recently constructed wings (the Sammons and Vanderbilt) – history enthusiasts will no doubt prefer the former. It should be noted, though, that many rooms benefit from excellent views of the Blue Ridge and Smoky Mountain ranges. While the Grove Park is undeniably geared towards the 21st century traveller and perhaps lacks the specific period ambience of smaller rustic hotels and inns, it still boasts a breathtaking metaphorical guest book. 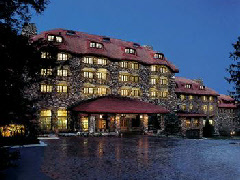 Famous guests include William Jennings Bryan (who delivered the keynote address at the inn’s opening in 1913), F. Scott Fitzgerald (who stayed in Room 441 during the summers of 1935 and 1936), George Gershwin, Thomas Edison, Henry Ford, and a total of eight U.S. presidents beginning with Woodrow Wilson.